Sunrise Greece has a lot of destinations for couples to choose from so you can just imagine how hard it was for me to choose where to go. I could’ve settled with just Santorini but when you come all the way from Asia and spend hours and hours in transit, I think it’s only wise to make the most out of it, right? So what should our second destination be? Should we check out the Swiss Alps? No, it might be a little too cold during that time. How about Paris? Been there, done that. Salzburg maybe? Quaint, charming and old-worldly, sounds like a romantic getaway to me. Yes, please. Sold! For those of you who don’t know, Salzburg is Austria’s UNESCO-listed city filled with beautiful views of the Eastern alps, grand domes, spires and medieval architecture. Every minute I spent wandering around this city made me feel like a real life princess in the olden times–especially whilst walking around in a bridal gown designed by me. To be honest, I didn’t really design this dress to intentionally match Salzburg’s charm. Good thing Amie of Sunrise Greece knew better. She knew my gown would be perfect for Salzburg so she made sure to save it for last. Sunrise Greece’s hair stylist then styled my hair in a traditional Bavarian style braid and everything just came together. It was perfect! We shot in all the prettiest spots, most of which may look familiar to you because of The Sound Of Music. Schloss Leopoldskron, Mirabell Palace Gardens…yes, I can now say I’ve been to some of The Sound Of Music’s most iconic spots. What an experience! Not only that, I also got to ride a true to life Bavarian horse…while in a ball gown. Whew! I was scared out of my mind!!!! When Sunrise Greece first told me about riding a horse, I was all, “yeah, sure! I can do it.” Oh boy was I wrong. The moment I saw the horses come in, my knees started to get weak. Not that they were unruly or anything, I’ve just never ridden a horse by myself before. I always had a guide with me to make sure I don’t fall off or do anything stupid. But then again, even though I didn’t have a guide with me in this situation, the horses’ riders and caretaker were closeby to make sure I don’t get injured or anything so at least I got through it. It was worth it anyway. 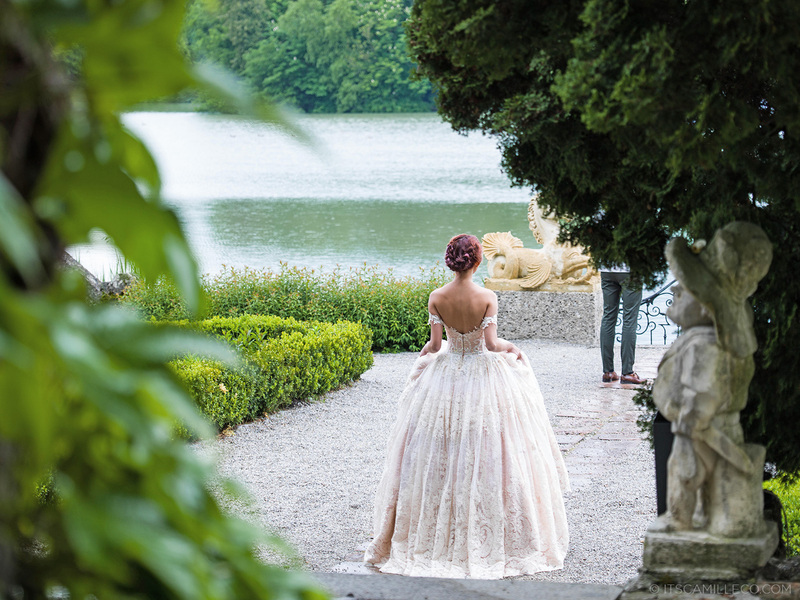 With the majestic castle standing behind us, everything looked like a fairytale come true! And just when I thought it couldn’t get any better, (I mean, come on. What can top Bavarian horses, palaces and The Sound of Music?) Sunrise Greece brings me to the most Instagrammable little town ever, Hallstatt. My Instagram heart was on overdrive! Pastel-coloured houses, lush greens, towering mountains and a lake at the center to reflect all of its beauty–it’s as if someone deliberately created this place for storybooks and movies. It’s so magical that I didn’t even care I was walking around in a ball gown and heels under the drizzling rain, slightly freezing to death. This is worth it. Sunrise Greece is worth. The photos are worth it. Can You please send me a link on how I can bug this dress because I want it for my wedding day. Hello! I absolutely adore this dress. You are very talented. I saw on your webpage that you do designer gowns. I am two years out from my wedding date, so I still have some time to save. How much does designing a gown like this cost approximately? Please provide an email so I can go over details. I love this design, and would like to make one like this with small adjustments. So beautiful！Once I see can’t stop my eyes. I love this dress!!! I am recently engaged and this is quite literally my dream dress… is it available for purchase? camille im your no.1 fun since im getting married very soon pls i want to see more your designs… im so inlove with your gown you wear at Salzburg.. pls give me your contact no. Thanks Doris!!! Just send an inquiry through coexist.online@yahoo.com and my assistant will help you out with everything! I am a frequent visitor of your blog and this particular write-up is just sooo awesome Ate Camille! It’s definitely breathtaking! Santorini is every girl’s dream! Gosh! I can keep looking at your photos for weeks and never get bored. hehe. I was a bit disappointed when I knew this isn’t a real prenup shoot but ye know, I can’t unlove you. Haha. You are naturally awesome and cool too! You inspired me to believe that dreams do really come true! Yay. I’m looking forward to your real prenup photo shoot soon! Please make it sooner! hehe. Keep the fire burning! Lurve you! To more blogs and nice photos! XOXO. wow! !so you stayed in palace! !its so overwhelming to hear this..i cant imagine a feeling staying in a palace..btw thanks for your reply miss camille..!looking forward to more posts! ohmygoosssh i hope you still design when i have my own wedding. :))) LOOVE the gown!!! i want my bridal gown to be made my fave fashion blogger/designer Camille Co. naaaks! I hope so too! Thanks Jarelle! You look absolutely so gorgeous here! Oh even gorgeous is not enough or maybe even words can’t describe it! Stunning photos! Amazing! You are a princess! Love the dress! Fabulous place! Thanks for the beautiful photos. I have been to Salzburg and Hallstatt many times. My mother was born in Salzburg. Thanks for the memories! Oh how cool! Thanks Babs! That mysterious guy seems familiar. If I’m not mistaken, he is your boyfriend, right? hehe! Who? What? Where? LOL.Thanks Cristy! Oh my gosh, Camille, these photos are so beautiful and romantic <3 :) I'm loving every last one of them! This is seriously every girl's dream come true! Princess Camille <3 love the shots. Such an intricate design of the gown! I love it! You look beautiful! Your dress looks breathtaking. And seems like I need to visit Salzburg and Hallstatt next, they look gorgeous. They’re gems really! Thanks Kathy!